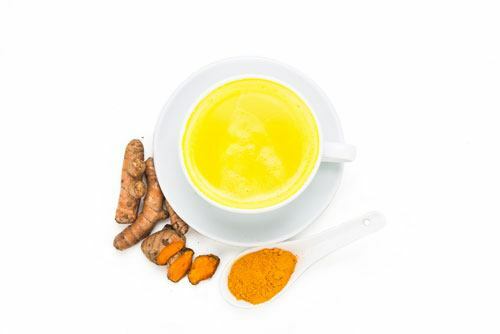 Do you know that a glass of warm turmeric milk can work wonders for your health and skin? Packed with excellent healing and curative properties, it is widely acclaimed as an effective traditional medicine. 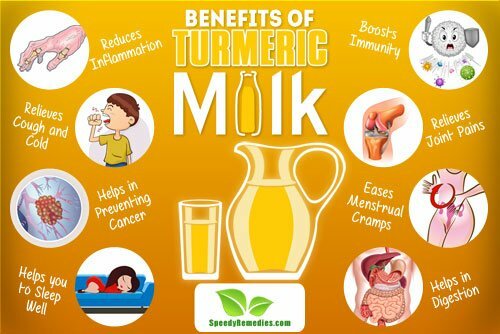 And what more, you have the benefits of both milk and turmeric in one drink. Turmeric is rich in curcumin, the polyphenol that exhibits more than 150 therapeutic attributes including anti-inflammatory, antioxidant, anti-microbial, anti-allergic and anti-cancer properties. So, it is a possible preventive measure for almost every ailment you come across. However, turmeric has poor bio-availability due to low absorption and easy removal from the body. Thus, turmeric should be used in combination with peppers or fats (coconut oil, flax seed oil or olive oil) for improved absorption. Here’s how you can reap the numerous benefits of turmeric with this turmeric milk. Mix water and milk in a pan. Add crushed turmeric and crushed peppercorns. Strain the mixture and drink (you can add honey as per your taste and requirement). Vegans may use coconut milk or almond milk instead of cow’s milk and jaggery or maple syrups instead of honey. You can add ginger, cinnamon or cardamom, as per your tastes and requirements. These herbs are rich in anti-inflammatory and anti-spasmodic properties that may further enhance the nutritious value of the remedy. Packed with anti-oxidants, antiseptic and anti-inflammatory properties, turmeric is one spice that can be your cure for almost all possible ailments. Highly effective, turmeric extract contains curcumin, an antioxidant that blocks inflammatory pathways in body by restricting the launch of inflammation and swelling causing proteins. In fact, several studies support the benefits of curcumin for the treatment of various inflammatory conditions like arthritis, eczema, asthma and inflammatory bowel diseases. A 2009 study published in Alternative Medicine Review stated, curcumin possesses great potential as a therapeutic agent for a variety of inflammatory conditions. Another 2004 study published in The Journal of Alternative and Complementary Medicine stated, curcumin exerts its anti-inflammatory activity by inhibition of a number of different molecules that play a role in inflammation. Owing to its decongestant property, turmeric milk is one the most effective remedies for treating sore throat and severe cough and cold. The anti-microbial property of turmeric blended with the soothing effect of milk, provides a quick relief from respiratory problems, thus soothing cough and congestion naturally. The decongestant and expectorant property of turmeric makes it a natural ‘aspirin’ for the body, thus relieving headaches caused due to congestion of chest or nose and body pain. Curcumin, a derivative of turmeric is extremely helpful in slowing down the spread of cancerous cells in the body, thus preventing cancer. Curcumin restricts the multiplication of tumor cells in the body, destroys already existing cancerous cells and prevents the development of additional blood supply for the growth of cancer cells in the body, thus preventing cancer. It stops laboratory strains of cancer cells from proliferating, thereby contributing to cancer prevention. Also, turmeric makes chemotherapy even more effective by protecting healthy cells from the damage caused by radiation. Finding difficult to get a proper seven hour sleep? Drink a glass of turmeric milk and you can enjoy a deep, sound sleep. Yes, turmeric is one spice that effectively helps in relieving pain and stress from the body and induces sleep. Milk is rich in serotonin and melatonin (sleep controlling hormones). And what more, when combined with turmeric, it produces tryptophan (an amino acid) that induces a sound and blissful sleep. The presence of curcumin in turmeric helps in the treatment of hepatitis and various other chronic disorders. Its anti-viral property restricts multiplication and growth of viruses in the body, thus boosting immunity and improving health. Curcumin content in turmeric milk acts against various viruses like the HIV virus, influenza virus, adenovirus and coxsackie virus, thus reducing the gene expression of the viruses by suppressing activation pathway. Owing to this, it is greatly helpful in the treatment of the problem. Boasting its anti-inflammatory and healing properties, turmeric milk is helpful in treating and strengthening joints and muscles. This helps in improving muscle flexibility and reducing pain in patients suffering from arthritis. According to a 2015 study published in Journal of Dietary Supplements, curcumin helps in easing joint pains in arthritis patients. Detoxification of liver is another important benefit of turmeric milk. It helps in detoxifying the blood, reducing inflammation and reducing internal clotting of blood. Proper cleansing of the liver ensures balanced secretion of bile, which further helps in breaking down fats. Also, rich in antioxidants, turmeric milk helps in purification of blood by cleaning the lymphatic system in your body. It acts as a thinning agent for blood and removes all the impurities in the blood vessels, thus revitalizing and cleansing the body. Packed with anti-inflammatory and antispasmodic properties, turmeric milk proves to be a boon for women suffering from menstrual cramps and spasms. Curcumin content in turmeric helps in reducing inflammation and muscle spasms, thus maintaining proper hormonal balance in the body. Turmeric is specifically beneficial for those with birth control devices, for curcumin helps in reducing inflammation caused due to such device. Turmeric milk is one herbal solution for maintain proper health of stomach and intestines. Turmeric milk helps in treating colitis and stomach ulcer that improves digestion and ensures proper health of the intestines. It helps in releasing bile by stimulating the gall bladder, which helps in easy digestion and absorption of fats and vitamins in your intestine. Journal of Dietary Supplements: Mitigation of Systemic Oxidative Stress by Curcuminoids in Osteoarthritis: Results of a Randomized Controlled Trial.